The group formed in order to establish more of a community in the area and to tackle the obvious problems of litter, lack of street sweeping and long-standing unsightly dumping of rubbish outside of the block of flats at 36 – 40 Wells Road, which constitute a health hazard. The group met B&NES council officers in order to agree actions to solve the problems. This resulted in some slight improvements which were not maintained and ultimately the landlord of the flats sold them. With a new owner the situation currently remains as bad as ever with abandoned, partly filled recycling boxes, rubbish etc, accumulating in this area. Street sweeping in this area is dependent upon individual requests by local people and there is regular dumping of rubbish on the wrong day along this lower section of path. Despite the setbacks we will continue to pursue a solution to this issue and recent pressure has resulted in considerable improvements to neighbourhood upkeep. As of the middle of March 2015, the new landlady and letting agents for 36 – 40 Wells Road are in touch with the group and are taking action to clean up their frontage and make their tenants aware of their responsibilities. We hope this will lead to sustained improvement and will continue to monitor the situation. A group litter-pick was arranged and members swept and tidied the streets using council cleaning equipment. Cllr. Ben Stevens joined the group. The group has organised community events when daffodils were planted on the green slopes on both sides of the road, using bulbs donated by the Mayor of Bath’s scheme for planting, via the Bath in Bloom committee. Also, several fruit and nut trees and bushes, provided by B&NES, were planted on the higher green slope behind St. Mary’s Buildings. 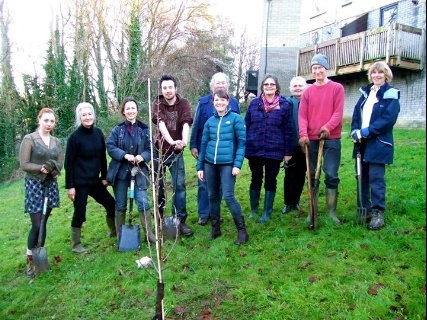 Members water and tend the new trees and look forward to blossom this spring and some fruit once the plants are established. 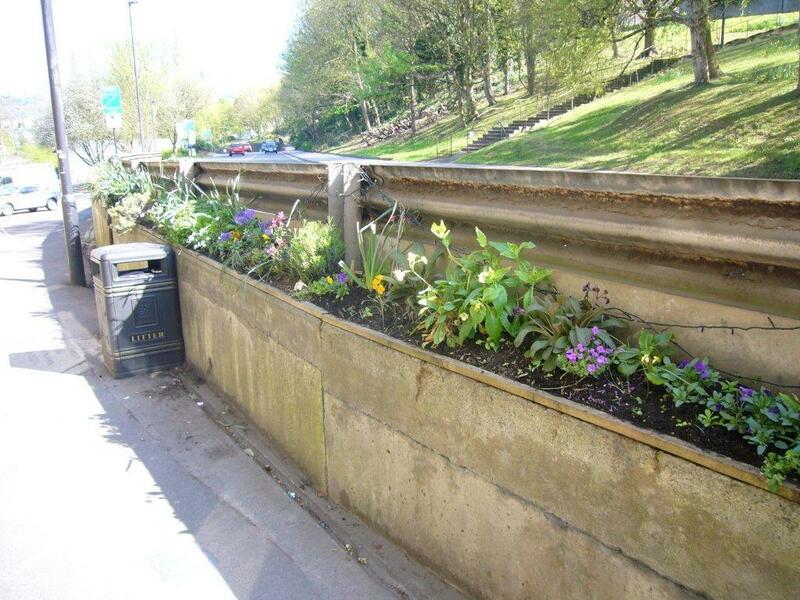 A garden has been established along the top of the retaining wall between Wells Road highway and pavement. This was decorated with fairy lights at Christmas that remained up all year to provide some much-needed morale boosting in the evenings. A major concern of local residents is the establishment of safer walking routes to and from the city centre, particularly at night and during the dark evenings of winter. 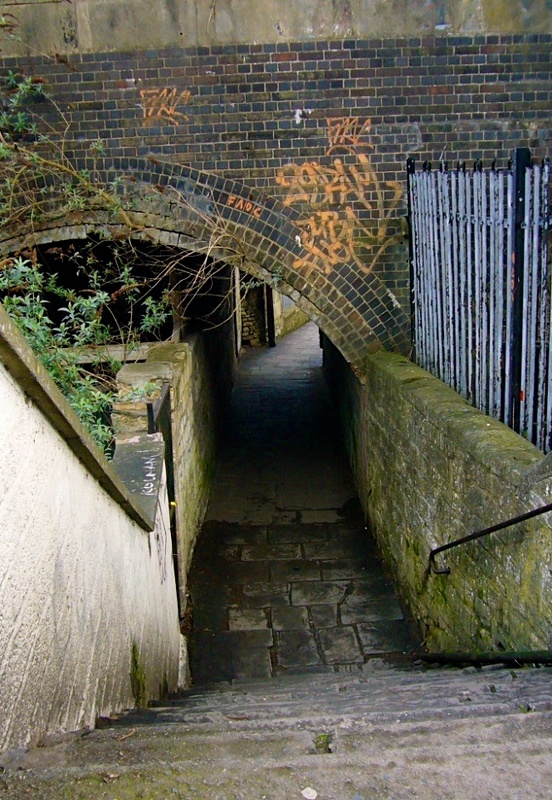 Our Wells Road Arches Project (WRAP) has successfully campaigned for improvements to the cleanliness and property maintenance in and around the two pedestrian routes that pass under the railway bridge running between lower Wells Road and the Lower Bristol Road. Officers representing Network Rail, B&NES Cleansing and Lighting Teams, the local Crime Prevention Unit, local councillors and ourselves have all been involved in resolving the problems in this area.